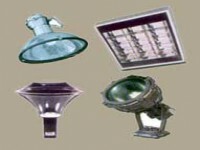 We are one of the renowned Industrial Lighting Fixtures Manufacturers of India. Quality is our commitment and to maintain it, we leave no stone unturned. Our Lighting Fixtures are highly reliable and durable. Our dedicated manpower is our backbone and utilizes their talent in manufacturing superior quality lighting fixtures. All our products are designed keeping in mind the requirements of our customers. These electric lighting fixtures are tested thoroughly before delivering them to customers.